Loving this series, hope you do turn it into a book. It worked for Randall Munroe…. Strangely, Wikipedia currently says that the Sagnac effect depends on the angular velocity, not the linear velocity. And the Michaelson et al. paper gives the phase difference between the light passing the loop in opposite directions as 4 A omega sin(phi) / lambda V, where A is the area of the loop, omega the angular velocity, phi the latitude, lambda the wavelength of the light, and V the speed of light. The radius of the Earth dropped out of their derivation. What matters is the angle between the plane of the loop and the axis of rotation. The effect is strongest at the poles, where sin(phi) is large, and zero at the equator. 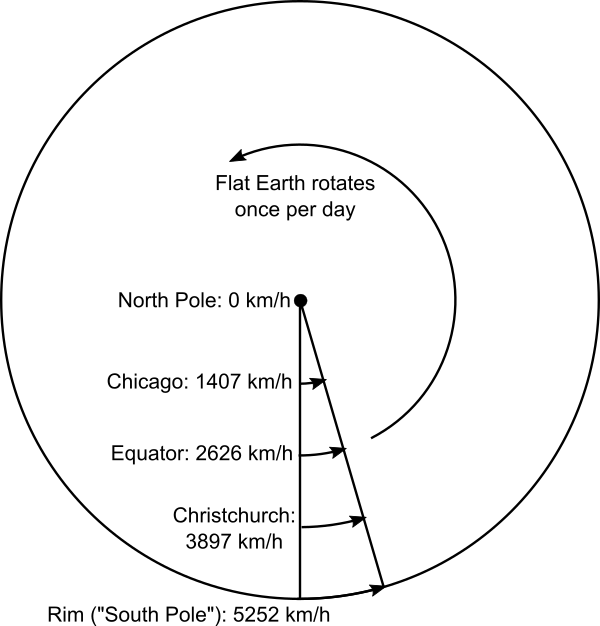 This still distinguishes a flat Earth from a spherical Earth, though. In a flat Earth, the horizontal is always perpendicular to the axis of rotation, and so the effect would be constant everywhere. It depends on how you break it down. The formula on Wikipedia uses ω sin φ as you noted, but it could just as easily have used v/r, where v is the linear velocity and r is the radius of Earth. This is because v = ωρ (where ρ is the distance from Earth’s axis of rotation), and ρ = r sin φ. Except that in the formula (from the Michelson paper), phi is the latitude, not the angle from the pole, as is more usual in spherical coordinates. So rho = r cos phi, not r sin phi. The important factor is rate of change of linear velocity with respect to north-south displacement, not the linear velocity itself. This rate of change is greatest at the poles, and least at the equator. Hi all, thanks for your comments. I’m not by any means an expert on the Sagnac effect, and I may well have gotten a bit confused in my reading about it. I’ll take a close look at it again when I get time and perhaps revise this post. 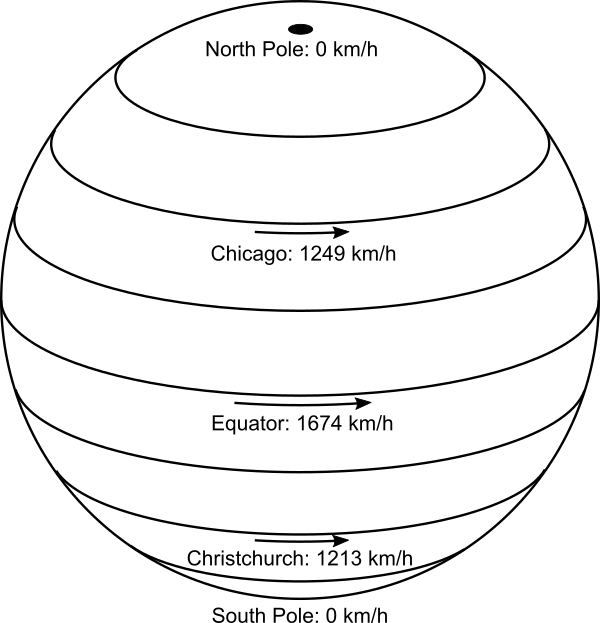 OK, Michelson’s sin φ term is from the inner product of the angular velocity vector (in the direction of Earth’s spin axis) and the area vector (perpendicular to the Earth’s surface at Clearing Illinois), which is indeed the sin of the latitude (so zero at the equator and 1 at the pole) or cos of the angle from the axis. Of course, nothing requires us to arrange our loop in the local surface of the Earth; it can be upright or angled instead; what matters is the component of area as projected onto a plane perpendicular to the spin axis. So build your loop on the North- or South-facing side of a big building near the equator to get a measurable result there. All the same, the w in question is the Earth’s spin angular velocity, one turn per (sidereal) day. For Sagnac effect detectors in our hand-held electronic pieces of wizardry (I read that the term “gyrolaser” gets used), I imagine we actually use three loops about perpendicular axes, since it would be silly to make assumptions about the orientation in which the user is holding their device ! That would give us all three components of the angular momentum vector, which is what we’d surely want in any case. 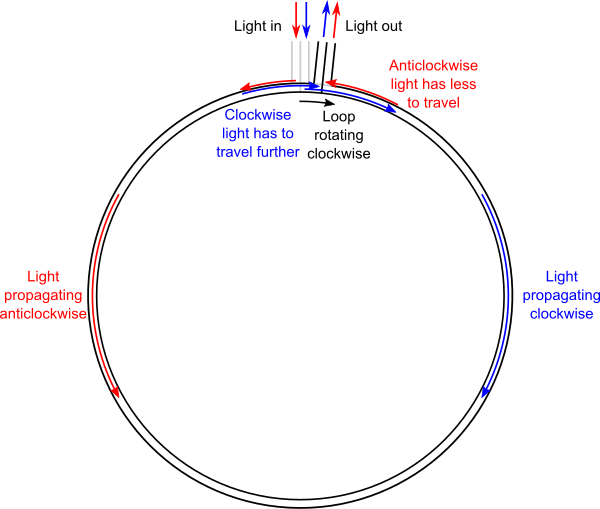 For a flat Earth, if it does any spinning at all (rather than being the one true fixed and invariant centre of the yadda), what would matter is the inner product of its spin vector (along the axis of spin) and normal to the plane of the loop traversed by the light; in Michelson’s case, the vertical component; and this would produce the same result at any location on the flat Earth, regardless of latitude. Another paper (here: https://arxiv.org/pdf/gr-qc/0401005.pdf as PDF) does show that the speed of the emitter/observer of the light matters, but that’s speed relative to the trajectory the light is traversing, so still won’t make any difference (to the currently-detectable leading-order term) based on where you do the experiment on a spinning globe and the loop is moving with you, aside from a slight effect due to you being at the edge of the loop, while your shared rest-frame spins (and what matters is your distance from the loop, not from the spin axis). The effect (to leading order) is equally well explained by relativistic theory or luminiferous æther ! I note that the situation is further complicated by the orders of magnitudes of terms. Michelson’s 2010′ by 1113′ field at 41°46′ N spans 25ish seconds of arc east-west and nearly 11 seconds north-south; these lead to perturbations we can’t ignore when considering a λ.Δ (i.e. 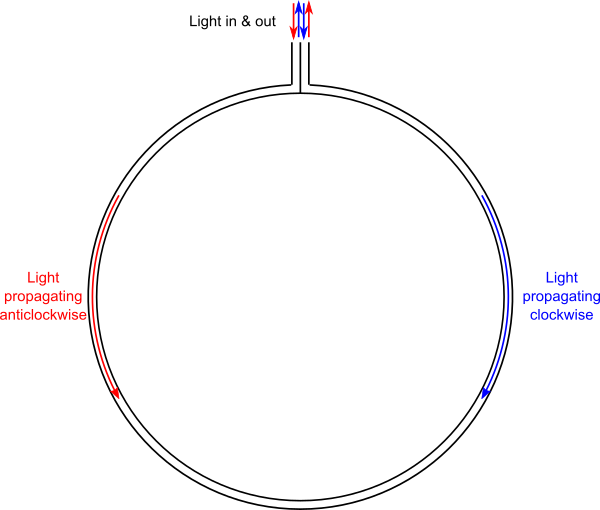 c.Δt) on the order of 17 parts in a million million (17.64e-12) of the length of the circuit the light traverses. The analysis *must* take account of differences in length between the nearer-pole and nearer-equator sides of the loop; assuming it’s a rectangle would be bogus. Further study to come ! 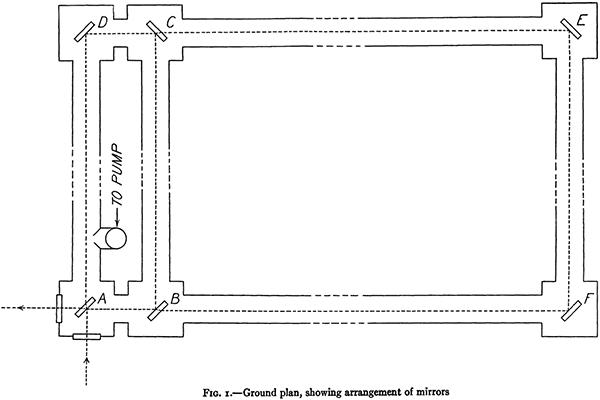 The first of the two Michelson papers that David M-M references seems to be using a “rectangle” whose sides are segments of, alternately, two parallels of latitude, and two meridians.